You shop local, you eat local—you even vacation local. But are you choosing to drink local? We have a world-class wine region right at our fingertips, yet sometimes it’s easier and cheaper to order a wine from the menu that’s been imported from France, Italy, Australia or Argentina than it is to order a wine produced less than thirty miles from the restaurant. 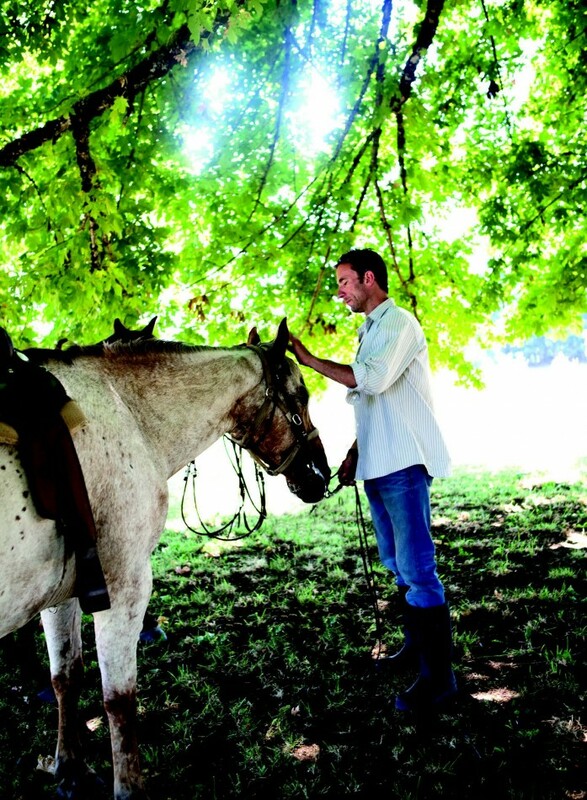 Fortunately, restaurants are increasingly supporting the Oregon wine scene. Some menus have extensive bottle selections that include hard-to-find library wines. Others list a variety of wines by the glass or host special winemaker dinners. The newest trend—and most sustainable—is the selection of rotating wines on tap. 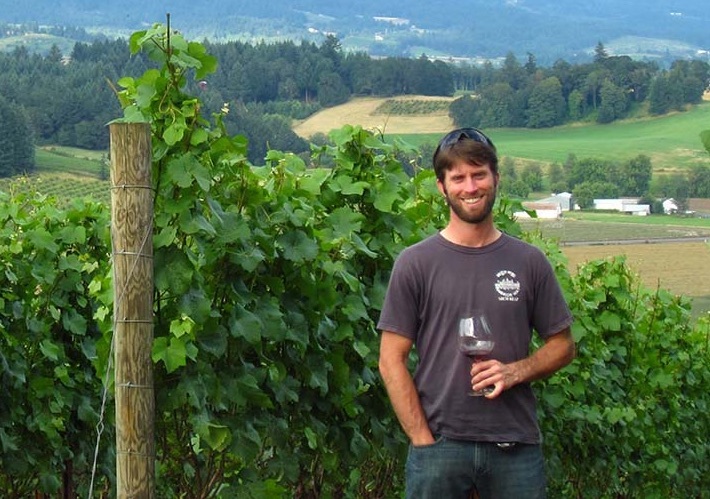 Check out these local taps for a pour of Oregon’s finest wines. 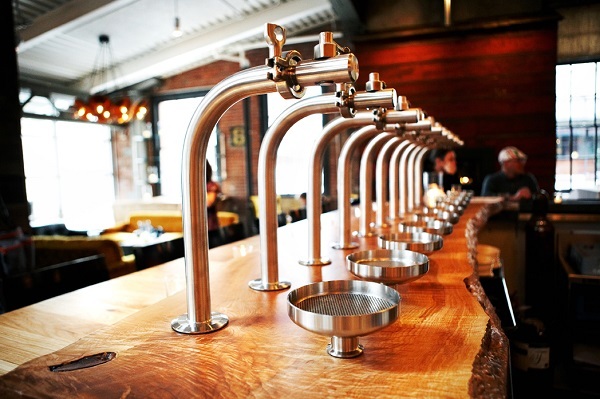 Walk up to the bar at Irving Street Kitchen and you’ll notice a row of gleaming brass taps. 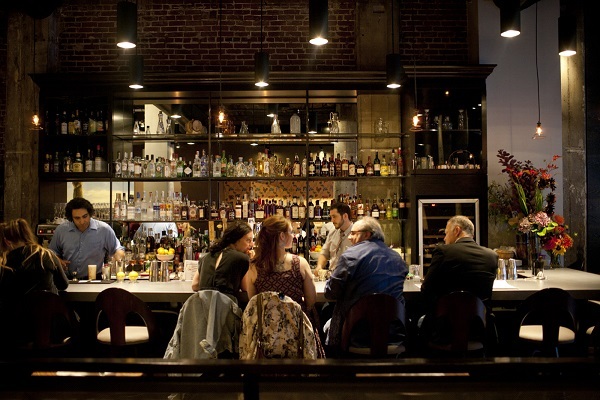 Irving Street Kitchen hosts a barrel-to-bar program that offers a rotating list of local wines on tap from some of the area’s best producers, such as Anam Cara, Ribera and Andrew Rich. Pours can be purchased by the glass, half bottle or bottle (or should I say large jelly jar… so quaint, so charming). The Bent Brick, Toro Bravo, Tasty n Alder, St. Jack, Raven and Rose, Imperial, Grassa, Park Kitchen and Tap and Growler all have strong regional tap wine programs. These restaurants work with a variety of local producers to bring you the most fruit-forward, best-tasting wines available. 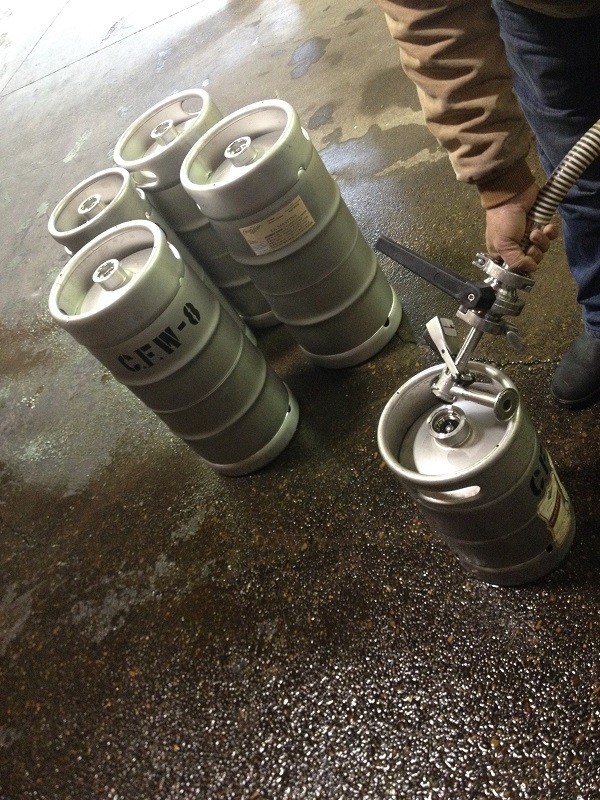 The Bent Brick in Portland and Tap and Growler in Eugene even fill growlers for takeout wine—talk about convenience. In addition to a variety of local wines and beers, Tap and Growler and American Local (one of Portland’s newest and tastiest affairs) also have Oregon purveyor SakéOne Momakawa saké on tap for a cultural twist. Allium Bistro in West Linn showcases 60 wines by the glass at any given time using a Cuvenee wine dispensing system to prevent oxidation and maintain the wines at optimum cellar conditions. 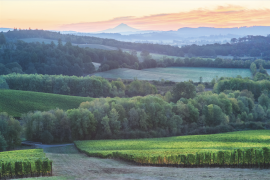 This place is one my personal favorites, as many of the wines on Allium’s list are sourced from lesser-known yet stellar Oregon wineries located in the less-traveled eastern side of the Willamette Valley. When you find a wine you want to go home with, Allium also offers a wine concierge service and retail wine shop so you can purchase the wines to go by the bottle. The Joel Palmer House in Dayton offers an exquisite menu and extensive list, including rare bottles specially produced for Salud fundraising events that have never been offered to the public at large. In fact, their menu is built around the wines they highlight (primarily Willamette Valley pinot noir). For a real treat in food and wine, this is a place you don’t want to miss. Coopers Hall is an urban winery/taproom/restaurant located in the industrial section of SE Portland and features what is likely the largest selection of Oregon wines on tap. Coopers Hall offers selections from 44 rotating taps, most of which are locally produced wines (as well as a few beers and ciders). Relax in their expansive and rustically chic space and enjoy flights of wine and a savory meal or take your favorites to go in convenient growlers. There are not many places you can do that. Oven and Shaker has gone the extra mile in the world of food and wine. Executive Chef Cathy Whims understands that foods procured from local producers pair best with wines from the same area—food and wine pairing should be considered the perfect marriage. With that in mind, Cathy collaborated with Cana’s Feast Winemaker Patrick Taylor to specially blend a signature house red tap wine for the restaurant called Il Cavallo Rosso. This super Tuscan-style wine is a rustic and tasty blend of sangiovese, cabernet sauvignon, syrah, and merlot and is named after the two regions (AVAs) in Washington where the grapes were sourced—Horse Heaven Hills and Red Mountain. 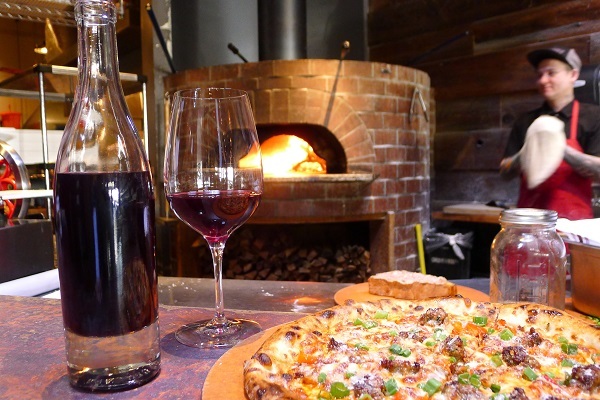 Cathy and Patrick worked together to create a wine that pairs perfectly with Oven and Shaker’s pizza and home-style Italian fare.